Hina Matsuri, literally translated means Doll Festival (also known as Girls Day), is celebrated March 3rd in Japan. Small porcelain dolls, dressed like court nobles from the Heian period are displayed in the homes of families with daughters. I did a little digging to find out a bit more about the background of this day along with how it is celebrated in modern Japan. The origin can be traced back 1000+ years (!!!!) to the Heian period which is known to be the last division of classical Japanese history, running from 794 to 1185. The Heian period is named after the ancient capital of Japan and capital of that time (Kyoto). This time period was a peaceful era and also considered the peak of the Japanese imperial court. It is noted for its art, especially poetry and literature. Up until this time, China influenced Japan a lot, however this was a period where society focused more on Japan itself and less on foreign influences. This is also the period before and leading up to Samurai coming to power. I did a little more reading on the Heian period and found that women were valued very highly and were said to be more powerful than men. Female authors were highly regarded and even served in court. Back then, straw hina dolls were sent down a river to sea, taking away bad spirits, health problems, or any troubles with them. This part of the tradition does not happen anymore because the dolls would get caught in fisherman’s nets. In Kyoto still today, the Kamo Shrine will still celebrate by sending the little straw dolls straight out to sea (avoiding the river all together) and then later bring them back to the shrine and burn them once everyone leaves. It is too bad this part of the tradition has disappeared because it seems to be the most significant part in the origin story. Apparently it comes from an ancient Chinese practice where the sin and misfortune of a person, body and spirit, are transferred to the doll and removed by sending it down the river. It was during the Edo period (1615-1868) when the tradition of displaying hina dolls began. The third day of the third month of the year was a holiday in Japan before that time, but there are no earlier records of doll displays on this day. Below I have described the food associated with this day, although not so many people actually have them. Hishimochi: A diamond-shaped colored rice cake. They are usually red or pink, white and green. The red is for chasing away evil, the white is for purity and the green is for health. Arare: Little bite-sized crackers that are either sweet or savory, depending on the region of Japan. Ushiojiru: Clam soup. 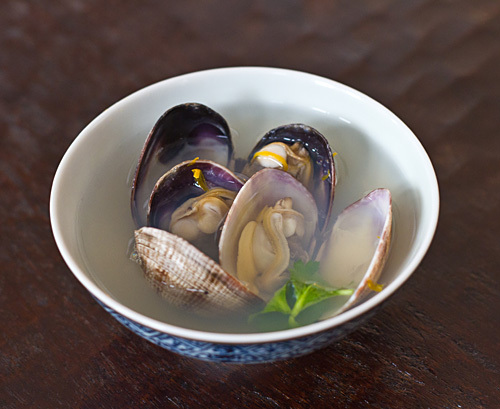 It is a simple salt-based soup with small clams still in the shell which represents unity and a good marriage. The traditional drink is called “shirozake” which is made from fermented rice like sake except it is nonalcoholic so children can drink it too. It is a cloudy white drink and tastes like sweet wine. I found a great article from the Japan Times going into detail about the different foods associated with Hinamatsuri that even includes recipes if you want to try your hand at preparing a traditional dish yourself. Families generally start to display the dolls in February and take them down immediately after the festival, literally by midnight. Superstition says that leaving the dolls past March 4 will result in a late marriage for the daughter. This legend seems to be taken the most seriously of all, everyone is sure to take down there dolls for fear their daughters won’t marry. Typically, it is traditional for the grandparents to buy the dolls. The dolls are not cheap either! A set costs around $1500 USD and can go up to $100,000 depending on the size and quality. Most homes just have one set of a couple, it saves on space as the average home is small without much room for storage. What are your thoughts on Hinamatsui? Does your culture have a holiday that is similar? Next > Meet our New Global Team Member!